That the Marx Brothers are still funny today (for the most part) suggests that there must have been a few split sides back in the 1930s when their popularity was at its peak. Much of their work is by now quite dated and the way characters in their films insisted on bursting into irrelevant song reflected more, inevitably, audience preferences of their day than those more demanding of today. Chico was himself a loveable rogue, a womaniser on and off screen with a lovely but fake Italian accent reminiscent of that spoken by gangsters in the early part of the last century. His biggest contribution to the films he starred in with his brothers was probably his carefree sense of humour and his constant scheming, but he will also be remembered for his piano playing, both its comedy and musicality. There were six brothers in the family, one sadly dying in infancy, five growing up to be entertainers of some kind, three of whom would grace the silver screens for the best part of two decades. While their real names have somewhat faded into history, Groucho, Chico (pronounced CHICK-O) and Harpo, as they were known to the world, have far from disappeared as television networks round the world still show their films with some regularity. I notice the table is set for four. 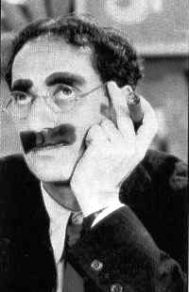 Groucho was famous for his sharp and very cynical wit, a loveable scoundrel with a contempt for opera, manners and basically anything organised into rows. This master of sarcasm, and word play both lexical and grammatical (his once commenting, “I’ve had a wonderful evening, but this wasn’t it!’) was impossible to get one over on given the sheer speed of his responses and the perpetual suspicion he had of anybody else. You got a some mail for me? No, you don’t work here. Harpo was the clown of the three, and continuing the then recently lapsed traditions of silent movies to appease large parts of audiences reluctant to adapt to films with scripts (seems amazing to us now) did not speak at all during any of the films, expressing himself instead through exaggerated actions which probably have lost their appeal today, but which were central to the plot of the films when they were released. Harpo was arguably the best actor of the three, his character and part in the plot coming across through his expressions and body language. But like his brother Chico he was also a very accomplished musician whose harp playing not only got him his name literally but also metaphorically, as his musicianship was a central part of almost ever film. Their films were not complicated plot-wise, but neither were they predictable, and they have stood the test of time in many ways. Arguably, they were ahead of their time. Their most dependable supporting actress, Margaret Dumont was said not to understand their jokes and thought she was doing drama. But this aside, she and the brothers worked well enough together to create not so much masterpieces but quality films that many people report being able to watch even eighty years later. I am one of these people, although I must admit, I usually skip the songs.